In a series of five articles I have discussed how boilerplate text elements such as prompts and labels could and should be taken out of pages and centralized in resource bundles. I have explained how resource bundles can be implemented in database tables, how the bundles can be refreshed at run time and how different user groups can be served with different resource bundles. 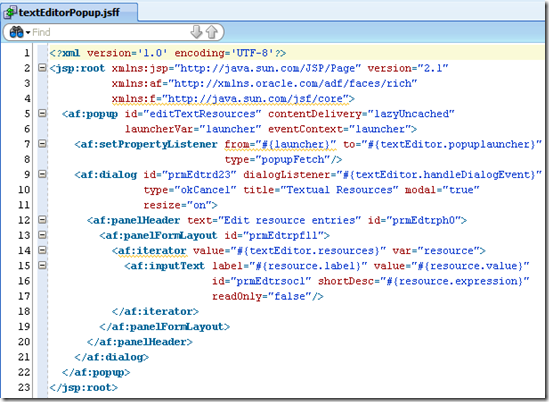 The previous article demonstrated how text properties can be edited at run time, in the context of the application. The approach discussed for live text editing works fine. However, its current implementation requires specific manipulation – of every individual page. 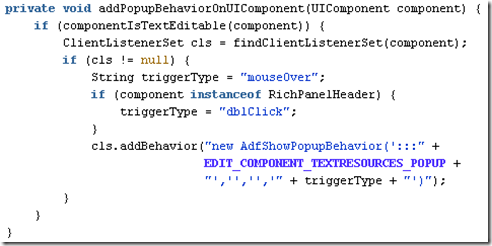 Each page contains a popup component and each component to be edited needs to have an associated showPopupBehavior or even a commandImageLink. This article outlines a more generic approach that requires virtually no page or component specific preparation. The popup is takes out of the page into a page fragment. 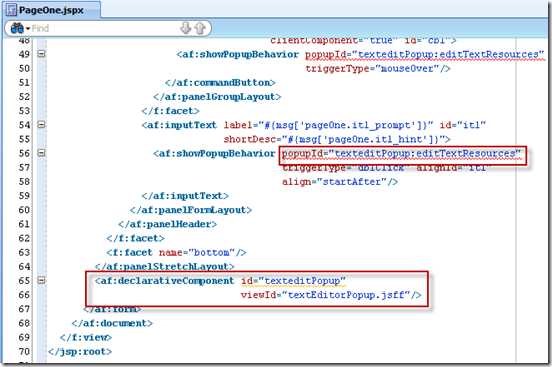 This page fragment is included in every page using a single declarative component tag. 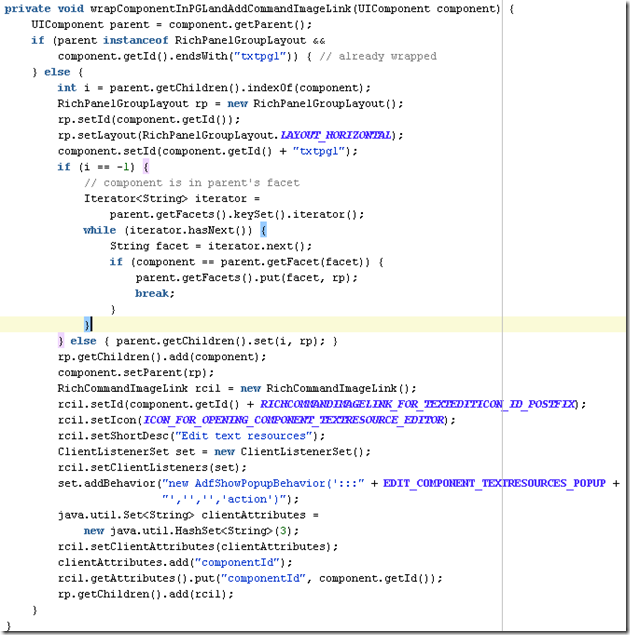 Via a phaseListener on the f:view tag, the UIComponent tree of every page is programmatically manipulated before being rendered. 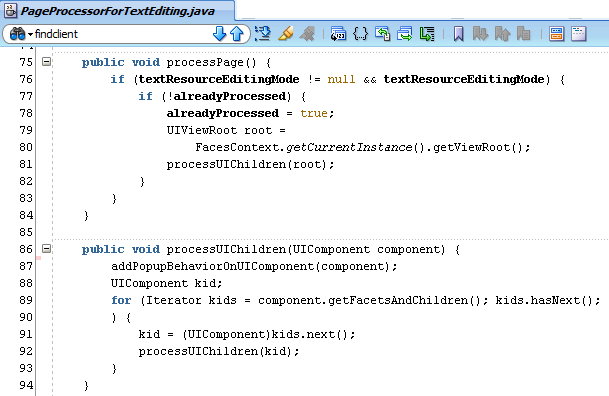 The manipulation consists of adding showPopupBehavior children to all UIComponents with textual properties. 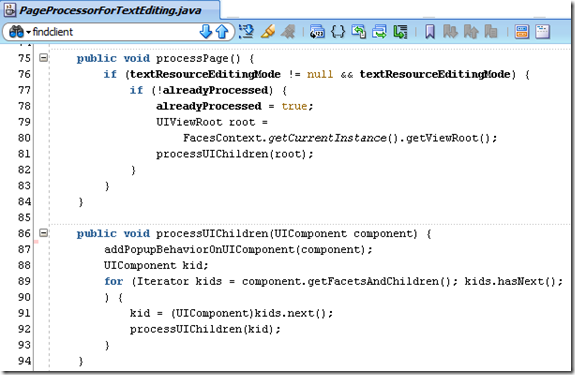 The manipulation of the UIComponent tree is a fine way to influence the appearance of any JSF application at run time, based for example on meta data that can also be managed at run time. I have made use of this approach on several occasions. 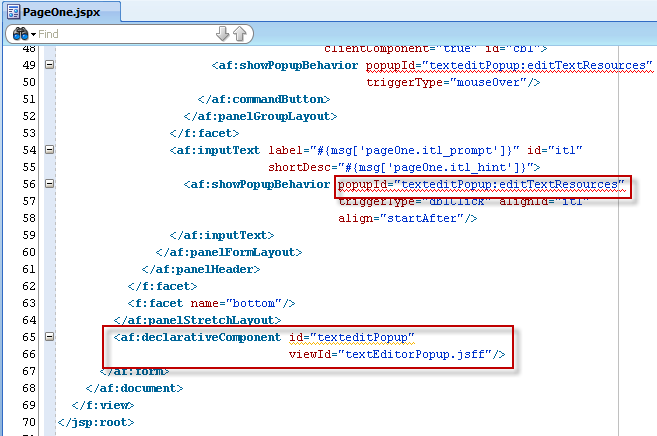 Note: because the declarative component is a naming container, the reference to the popup in the showPopupBehavior components is changed from just editTextResources to texteditPopup:editTextResources. Whenever the commandLink is clicked to enter text editing mode, the page is re-rendered and before rendering takes place, the viewPhaseListenerBean steps in and calls the processPage() method in the pageProcessorForTextEditing bean. 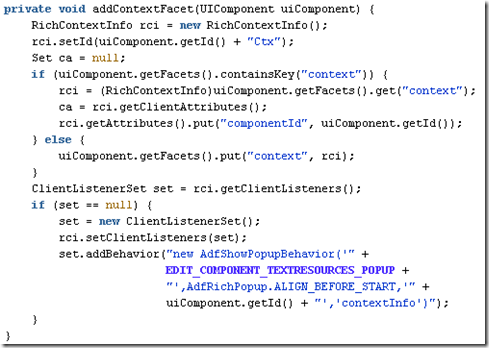 This method traverses the UI Component Tree and calls upon a helper method to add the showPopupBehavior listeners. 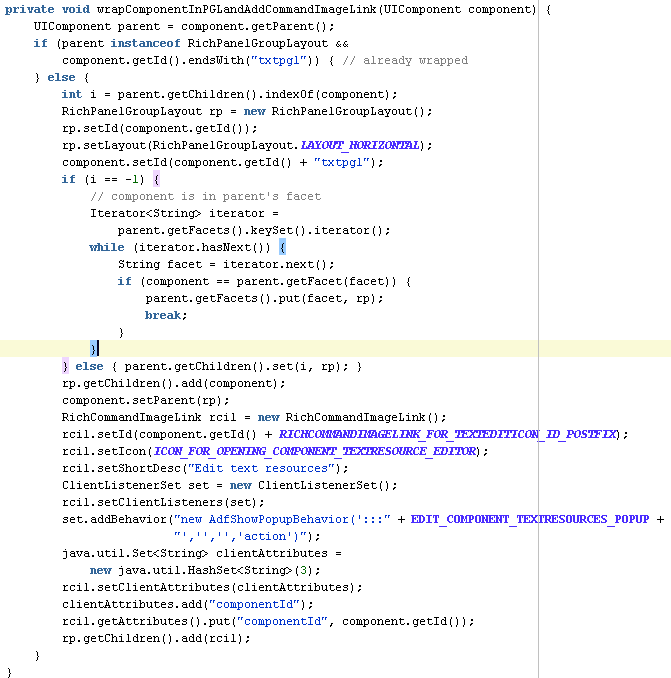 The findClientListenerSet() method inspects a UIComponent and tries to locate its clientlistenerset. 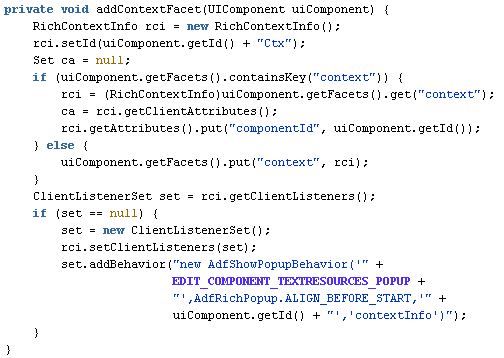 If it does not exist, it finds out whether the UIComponent is an ADF Component that supports clientListeners (i.e. exposes a method getClientListeners()). 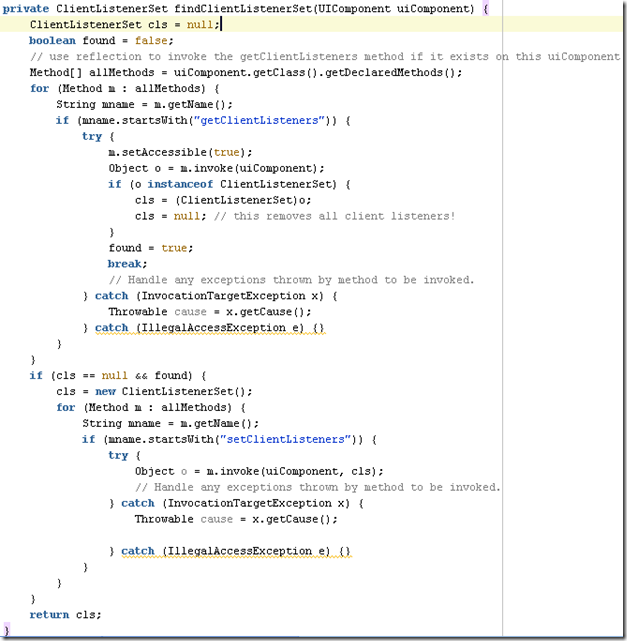 If it does, a new ClientListenerSet is instantiated and set on the component. when clicked, the popup editor will open. 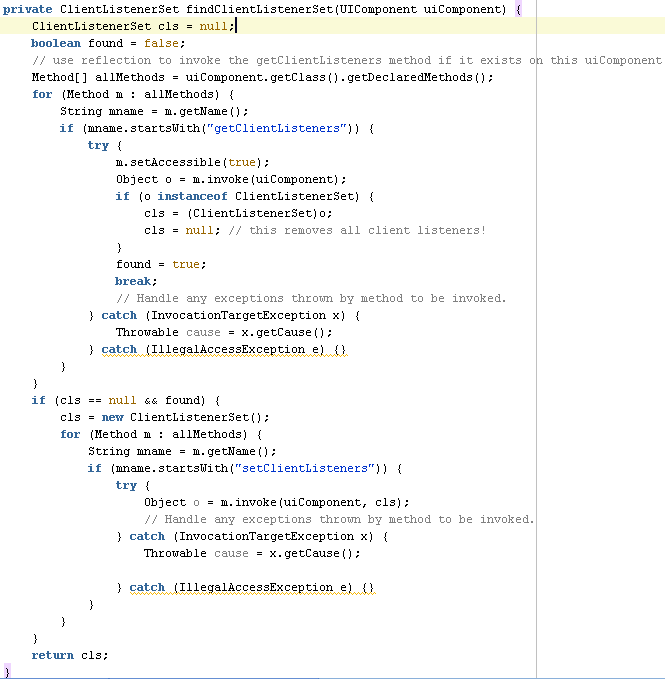 Note that only input components such as inputText and selectOneChoice support the context facet. 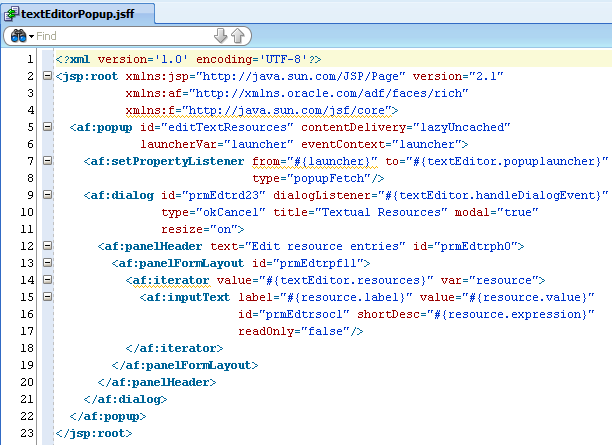 Download the ADF application with the code demonstrated in this article: ADFFacesWithResourceBundle_Step7_DynamicUITreeManipulation.